Going ultralight is a great idea, but it can be really difficult to find the best ultralight backpack for your needs. First of all, you need to make sure the quality of the backpack is good enough. Too many ultralight backpacks cannot handle heavy use and you don't want to risk that you backpack fall apart! You also need to make sure the backpack have the features you need and that it's big enough for the stuff you need to bring (without ending up being too big and heavy). Having checked thousands of ultralight backpack reviews, we can say that the Osprey Exos is the best choice for most people. The Osprey Exos got a rating of 4.57 out of 5, while the average rating in the list below is just 4.01. This is the best reviewed ultralight backpack. We have checked 373,470 ultralight backpack reviews, so we can show you the weighted average rating of all the bags. If the Osprey Exos isn't your style, you might also consider the Ultimate Direction Fastpack. The Fastpack is a close runner-up with a rating of 4.43 out of 5. The second-best reviewed ultralight backpack. Finally, you might consider the Hyperlite Mountain Gear 3400. The 3400 is the third-best rated ultralight backpack with a rating of 4.40. Below is the list of all top 11 best ultralight backpacks. Great if none of the three bags above are your style. PS: We have checked 373,470 reviews to make this top 11 list! In what is becoming a trend, more and more hikers and backpackers are looking to lessen the weight of their load. This is why they tend towards ultralight backpacks, which are considerably lighter than traditional bags. Of course, choosing one is no easy task, particularly if you are not sure how to go about selecting this type of pack. Backpacks have rapidly evolved over the last few years. Thanks to technology, these bags can be given additional features without compromising quality or strength. These developments are what has led to the prevalence of ultralight backpacks in the marketplace. While ultralight backpacks are popular largely with hikers and backpackers, they have drawn all types of consumers. Essentially, these are the perfect packs for anyone who is looking to shed a few pounds from their overall load. Here we take a look at all of the features that make up some of the best ultralight backpacks and show you how to choose the best one for you. In most instances, ultralight backpacks are usually chosen for ultralight camping trips. These are where you carry no more than 10 or 12 pounds in total (excluding food and water) on your trip. Often, this means that you carry the bare minimum with you or take hi-tech items that are incredibly lightweight. So, what is the advantage for you? Of course, the most obvious one is that you don’t have to carry as heavy a load. This can make hiking and camping a lot more enjoyable as you will not be weighed down. Not to mention, it is a lot safer for your back as well. Nonetheless, one of the main reasons that ultralight backpacks are so popular is because it allows you to travel greater distances in a shorter period of time. Since you will be less tired, you will be able to explore further than before. A lot of people enjoy ultralight camping and backpacking because it also forces them to be minimalistic about the items that they carry with them. They are more likely to carry only the bare essentials and leave unnecessary luxury items at home. In this instance, ultralight backpacks can be categorized by the type of frame that has been incorporated into the pack. So, this narrows it down to simple frames, tensioned frames, and frameless backpacks. Of all the backpacks, frameless backpacks are the lightest, although they are also able to carry the least amount of load. Packable backpacks and folding packs fall under this label as they can be folded when not in use. Then, there is the simple frame backpack. 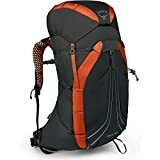 The main benefit of these backpacks is that they keep the backpacks somewhat rigid and also make it easier for you to carry the load with your hips (which is what is best). Last but not least, you have the tensioned frame. This frame allows you to carry a much heavier load with less hassle. It is also great for keeping your back ventilated while you are on the move. With ultralight backpacks, manufacturers simply can’t use the lightest fabrics available. Since these backpacks have to withstand considerable weights as well as environmental factors, special materials have to be used. The most common type of material used for ultralight backpacks is ripstop fabric. These are a hybrid of fabrics woven into a square-like pattern. What really sets this material apart, though, is that it also includes other fabrics at certain points in the weave. While this is usually either nylon or polyester, nylon tends to feature more heavily in ultralight backpacks. In addition to be quite lightweight, ripstop material has another special characteristic – it can minimize the amount of damage done to a pack. Now, this doesn’t mean that these packs can’t get rips or tears. However, you will be able to ensure that the rips will not spread any further than that one square of material. This makes it particularly good at surviving wear and tear for long periods. Recently, another material that is being used more and more is Dyneema. It is touted as being one of the strongest fibers in the world although a slightly different version is used for backpacks. Its strength and durability aside, Dyneema is also incredibly light but can hold a large weight. The downside is that backpacks made from this material can cost considerably more than any other type of material. Another type of fabric that is used a great deal in ultralight backpacks is weight. It helps to keep the weight down but is still able to carry a decent load. Not to mention, it works well to keep the backpack properly ventilated and more comfortable. Usually, with a backpack, you would consider the volume above all else – that is to say, how much you can carry in your pack. While this is still important, there is another element that you will need to factor in and that is weight. Since the entire point of this exercise is to lower how much weight you need to carry, you will have to find a compromise between weight and volume. This is because larger bags tend to use more fabric and thus, are heavier. Then there is the fact that you need to think about how much you want to carry in your backpack. If you will be using the most common (cheaper) backpacks, then you will have to opt for a slightly thicker and heavier one to help you carry the extra weight. When it comes to capacity, most ultralight backpacks are used for hiking and camping. If you will be hiking for a day or less, you will find that one that is able to carry up to 20 liters will be suitable. For a longer trip, you may want to choose one that can hold between 30 and 45 liters. For longer trips, backpacks that can carry between 45 and 55 liters may be able to take all of the items that you need. In cold weather, when you need to carry a greater number of supplies, most individuals will turn to a backpack of about 65 liters. Any backpack that you use should fit your torso measurements precisely. If not, you will find that it is quite difficult to walk with these packs on your back and your movement could be hindered. Ideally, a backpack should sit just below the nape of your neck and right above your hips. If you want a larger pack, make sure that it is only a few inches higher than your head. Now, there is no denying that a sturdier and more comfortable suspension system is going to add a few ounces here and there. This is why you may be tempted to stick with a more sparse harness. However, while you may save some weight by doing this, you will find it quite uncomfortable and heavy to carry a full backpack. So, it is better to stick with padded straps and belts instead. You will need to choose your hydration features, depending on what kind of activity you are doing. If you want extra pocket space and don’t mind having to pause your trek every so often, you can just look for water bottle holders on either side of the bag. If you don’t want this hassle, though, look for hydration reservoirs in the exteriors pockets that are connected to drinking and sip tubes. If you are going on exhausting treks or will be hiking in warm weather, the level of ventilation afforded by your backpack is quite important. This will determine just how cool your back will be while you are carrying your bag. For greater comfort, look for backpacks that have a lot of mesh on the back so that moisture doesn’t get absorbed by the fabric. Also look for features that push the bag away from your back so that there is better ventilation in this area. There are a lot of factors to consider when purchasing or choosing an ultralight backpack which is why there can be so much confusion involved. However, there are some things that you need to remember more than the others. First, is that early on, you will need to decide between weight and durability. Unless you are willing to pay a considerable sum of money, this is a choice that you will need to make. Of course, you can always simply choose a smaller backpack made from a more durable material, if you want. The other thing to keep in mind is that you should always weigh the backpack for yourself. There can be a certain level of variation, even in the same series. So, extra features such as lids or belts could add a bit of weight. If you are trying to keep things as lightweight as possible, even the smallest load could make a difference. So, this covers all that you should be aware of when choosing an ultralight backpack for your travels. Armed with this information, you are sure to have no issues in choosing one that is ideal for you and your journey. Classic ultralight backpacks and models that haven't yet got enough reviews to be ranked. List ID 85. Images from Amazon Product Advertising API and shop datafeeds.